Hamilton Counties first Taco Fest, Taco Takedown happens this January 12th presented by Sun King Brewing Company and Espolòn Tequila with music by Indiana's premier Mariachi band, Mariachi Sol Jalisciense at Ivy Tech Noblesville! • General admission $21(1pm-3pm) includes 6 tacos, complimentary Aperol Spritzer and tequila samples! • VIP admission $35(early entry 12pm-1pm) includes additionally a complimentary Sun King Pachanga and an Espolon Signature Margarita. • Kids 10 and under $7 - includes 2 tacos. Tacos from your favorite restaurants: Chuy's, Nachomama, Nameless Catering Company, Big Lug Canteen, TIJUANA FLATS FISHERS,IN, Verde - Flavors of Mexico in Carmel, Blind Owl Brewery, Pinnacle Catering Group, Condado Tacos - Indianapolis - Broad Ripple, Chef Seiji at Crossroads Catering, Table by Market District and more! The event will be hosted by local foodie personality, Sarah Murrell. 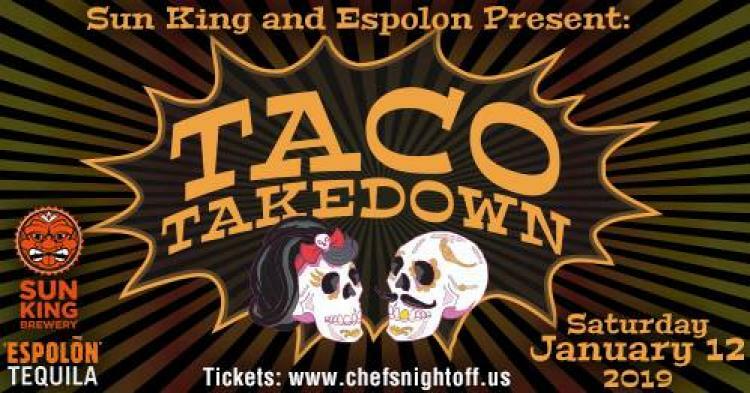 "Taco Takedown" judging will be done by Ricky Martinez of Delicia / Chef Craig Baker / Jolene Ketzenberger of Eat, Drink, Indy / Neal Brown of Ukiyo, Libertine and Pizzology, YouTube sensations Kristin and Danny Adam's and Indy Star's food expert Liz Biro!